Yes I am always one of those people filling out my name and address on one of those airline tags and every time I do it I say to myself...Gosh I need to make these. And I finally did. And just in time for our flight to spend the holidays in AZ. I keep all the cards we get for birthdays and holidays, I used the cards left over from my son's b-day to make these cute luggage tags. On the opposite side I used scrap card stock in bright orange that I had and laminated the whole thing, hole punched the top and to attach them to the bags I used 1" binder rings, found at office supply stores. The entire project took less than 30 minutes for 4. 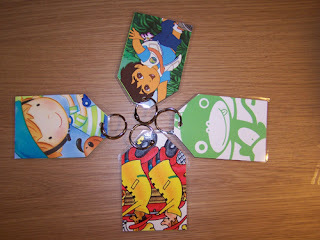 So don't put it off another day...make those luggage tags!